Dr. Pichet Durongkaveroj, Minister of Science and Technology, along with executives and officials of the ministry, visited Huai Hong Krai Development Study Center under the Royal Initiative of His Majesty the King, Doi Saket district, Chiang Mai Province, in order to follow up the situation of forest fire smog in northern areas. 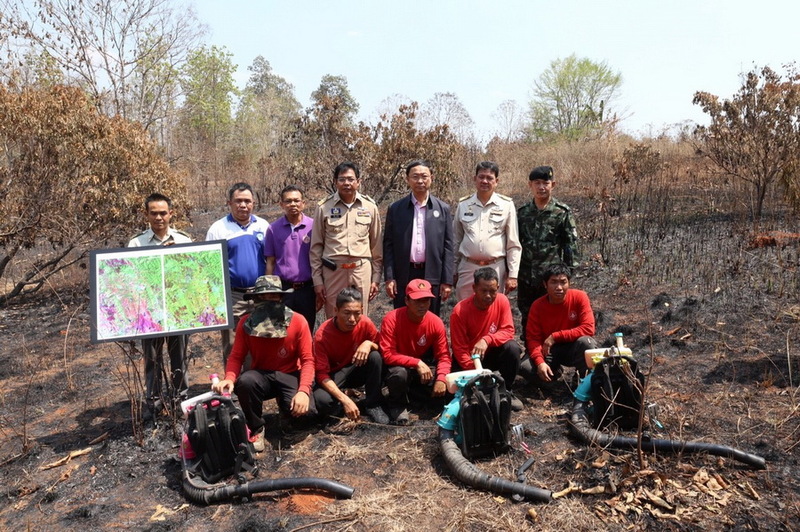 "For the situation of wildfire smog this year, GISTDA also supported the operation with academics and the database of the Centre for the Prevention of forest fires and haze (war room) in 9 northern provinces including Chiang Mai, Chiang Rai, Nan, Phayao, Tak, Lampang, Lamphun, Phrae and Mae Hong Son, throughout the months of January to April, so that agencies have access to geospatial information quickly and effectively. GISTDA has analyzed the risk area of forest fires by using a model developed to predict wildfires in advance, using soil moisture, characteristics of the leaves as fuel and prior Statistics. We can predict the risk area of forest fires in 7 days advance by mapping the predicted areas at risk of forest fires in three levels of risk as follows: high risk, low risk and no risk. Besides, the satellite data of GISTDA can also check points of heat (hot spots), which reveal that the current hot spots compared to the same period last year tends to decrease or increase. And using of satellite data to analyze new burned areas (Burnt scar) to assess farmland waiting to be burned and forest areas that have not burned. In the past, we have relied on farmland information, so we know how much the area of any remaining fuel in the forests and the agricultural is remaining. This will serve as an important basis for the Ministry of Agriculture and Cooperatives to deploy a check in real location.